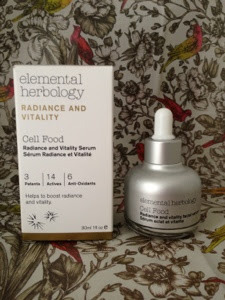 I used to think serums were a waste of money until I tried Cell Food by Elemental Herbology. I bought this about 6 weeks ago during my trip to Birmingham when I met up with some other bloggers. After hearing Jess rave about this (and that girl has SERIOUSLY good skin), I decided to spend the last of some vouchers I had on it, not expecting to be overwhelmed. Elemental Herbology combine natural actives with high performance scientific ingredients and are rich in vitamins, anti-oxidants, essential fatty acids and proteins. Cell Food is no exception - designed to boost radiance, they've packed in 14 actives and 6 anti-oxidants to this little bottle. It includes Kombuchka to increase radiance, Aloe, Rose Damask, Green Tea and lots more. The serum itself is a pretty regular looking, slightly runny white liquid. Two drops covers the whole of the face and I leave it a couple of minutes before applying moisturiser over the top. I actually saw an effect after just the first use of this serum. My skin just looked that little bit brighter. I've now been using it day and night for about 6 weeks and I can really tell the difference. My skin is super soft, and I just look 'well'. 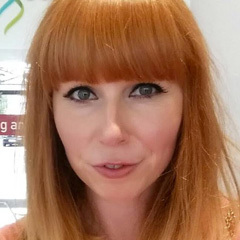 A colleague even asked me if I'd been on holiday as I had a glow to my skin. Cell Food 1 - Winter 0. The only thing that's slightly irritating about Cell Food is the pippet used to dispense the product. For some reason, even when the bottle's full, it struggles a little to pick the serum up unless you tilt it, but this is just a minor thing. This serum is pretty pricey at £42, but you know what, I actually don't care. I'm freaking out slightly at the thought of running out of this serum, so may have to buy a back up just in case it runs out on me without warning. I'll definitely be looking at other items in their range to see if all of them are as good as this one. Have you tried anything from Elemental Herbology before? I absolutely adore this serum too, it's so lovely on the skin and you can definitely see a difference after the first use! The pippet is a bloomin nightmare though, you're definitely not alone there. I have never heard of this brand before but this serum sounds amazing! Really in to my skin care right now. I have heard of this brand before and had some tiny samples (sachets, I hate sachets) but I just ignored them...sat there unused. 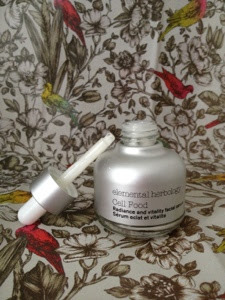 I haven't tried anything from Elemental Herbology, but the way you describe this serum I very much want to try it! It is definitely a little on the pricey side but good skincare is worth it to me.